By now, in its fourth season, the formula for The f Word is tried and tested, and there's very little variation from previous seasons. All the familiar elements are here: the main scene is a restaurant of 50 invited guests who all eat the same food cooked by contestant chefs. This season the contestants are UK celebrities and their families. Gordon shows them how to cook the food and then yells at them for not doing it properly. The food goes out to the diners and they decide whether to pay for it or not. There's an appetizer, a main course, and a sweet desert. He also has a cook off with a celebrity non-chef where they cook slightly different versions of a dish and a panel of tasters decides who made the best dish. Then there's a segment where Gordon goes off to meet ordinary people and teaches them how to cook healthy food quickly and easily. This season he is not raising any livestock himself, but Janet Street Porter raises 2 calves and then has them slaughtered at the end of the season, so that she and Gordon can serve veal -- this is not milk fed veal, but well-treated animals who would otherwise be sent off to continental Europe. There is also a regular segment where Gordon goes off in search of exotic food such as caviar or puffins -- and normally he helps to catch and kill the animal that provides the food himself. It is a fast paced show with lively editing and strong personality, so viewing it is easy and very enjoyable. 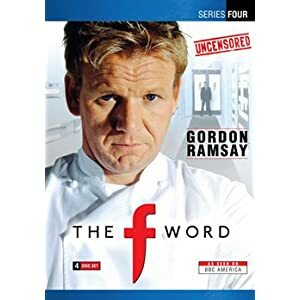 You learn about food and Gordon has plenty of passion and conviction.